Michael began his professional career as part of the original team that built the Smithsonian Institution’s National Air and Space Museum. After spending several years in career counseling and placement, he joined TSR, Inc., publishers of Dungeons & Dragons®, and rose to the position of Director of Games Development and Marketing. He was Vice President of Games Workshop US, and Vice President of Discovery Software International. While at TSR, he also designed numerous games and game supplements, sharing the H. G. Wells Award with frequent co-author Douglas Niles for AD&D® Battlesystem. 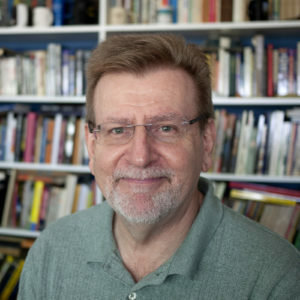 In the 1990s, Michael began working as a seminar leader and consultant in project management and other topics, which gave him the opportunity to follow his lifelong dream of being a writer. Having already accumulated a “writer’s résumé,” a collection of odd and interesting positions that would give him a wide perspective, he just needed some books to go with it. In rapid succession, Michael wrote the alternate history military thriller Fox on the Rhine (the first of several novels with Douglas Niles) as well as the first of many business books, Practical Project Management. His book Enlightened Office Politics (with his wife Deborah Dobson) was one of Library Journal‘s top business books of the year. In the meantime, he also publishes the annual magazine Random Jottings and founded the Timespinner Press and Canal Press publishing imprints. He received the Samaritan Medal for Peace and Humanitarian Service, awarded by the Samaritan people, for his work in the Middle East. Michael is also the only private owner of a real Apollo spacesuit. Michael was born in Charlotte, North Carolina. He spent his early years in Germany, where he attended kinderschüle, and then in Decatur, Alabama, before returning to Charlotte for college. Today he lives in the Washington suburbs with his wife and frequent collaborator Deborah Singer Dobson, a human resources executive. They have a son, James, currently a cadet at West Point, and two Shelties.